The new SDRPlay RSPduo is a 14-bit SDR dual receiver that covers from 1kHz to 2GHz (without hole), with dual-tuner (simultaneous reception on 2 different antennas). The SDRDuo is equipped with a software-adjustable LNA, 11 band filters and 3 antenna connectors, 2 female SMA and 1 Hi-Z input to connect a HF wired antenna (0-30Mhz) with Notch filter and low pass 0-2Mhz, TCXO 0.5PPM, clock function and 4.7V Bias-T power supply via SMA. The 2 SMA inputs now operate from 1 kHz (instead of 1.5Mhz) with 0-2 MHz low-pass filter to reduce spurious frequencies in LF and MW. Combined with the SDRuno software for Windows (free), the RSPduo can display up to 10MHz of spectrum on the screen or 2Mhz in simultaneous SDR reception with the double tuner. Delivered with: SDRPlay RSPduo metal case (delivered without USB power cable). See below the recommendations for use, installation and support request SDRplay. Description: The new SDRPlay RSPduo is a 14-bit SDR dual receiver that covers from 1kHz to 2GHz (without hole), with dual-tuner (simultaneous reception on 2 different antennas). The SDRDuo is equipped with a software-adjustable LNA , 11 band filters and 3 antenna connectors , 2 female SMA and 1 Hi-Z input to connect a HF wired antenna (0-30Mhz) with Notch filter and low pass 0-2Mhz, TCXO 0.5PPM, clock function and 4.7V Bias-T power supply via SMA. The 2 SMA inputs now operate from 1 kHz (instead of 1.5Mhz) with 0-2 MHz low-pass filter to reduce spurious frequencies in LF and MW. 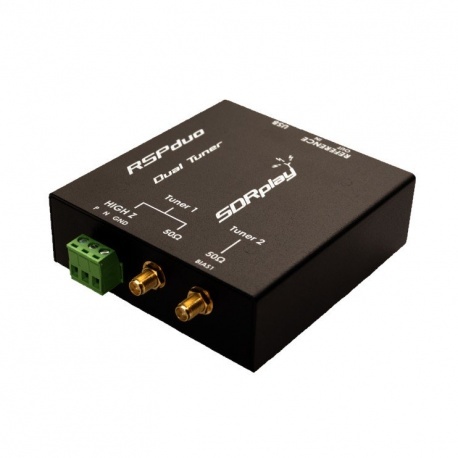 Combined with the SDRuno software for Windows (free), the RSPduo can display up to 10MHz of spectrum on the screen or 2Mhz in simultaneous SDR reception with the double tuner. Delivered with: SDRPlay RSPduo metal case (delivered without USB power cable). See below the recommendations for use , installation and support request SDRplay.